There are times when you want a lamp to gradually change from dark to light and from light to dark, with each push of a pushbutton switch. The circuit below performs this control function using a flip/flop and a classic pulse width modulation or PWM method. The circuit uses a common flip/flop IC to control the on and off logic states. A simple pushbutton switch toggles between the two states with each press of the button. A 555 timer is used to generate a triangle waveform clock while a common voltage comparator produces the PWM signal. An n-channel FET switches power to the lamp with up to 3.5 Amps of current. This power switching device can be sized as needed, so it could control much higher current if needed. 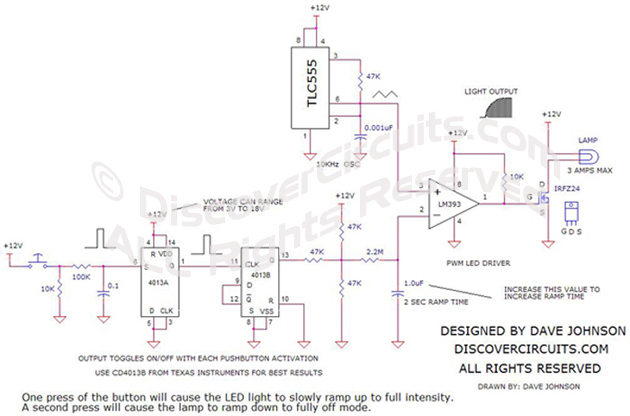 The circuit will operate from 6v to 15v. With the component values shown, the lamp will slew from dark to light in about two seconds. This time can be lengthened or shortened by changing the value of the 1uF capacitor.